CSIRO researchers have found a way to turn bird’s eye view photographs of our cities into useful digital maps that could help planners make our cities more liveable and provide emergency services with valuable information. 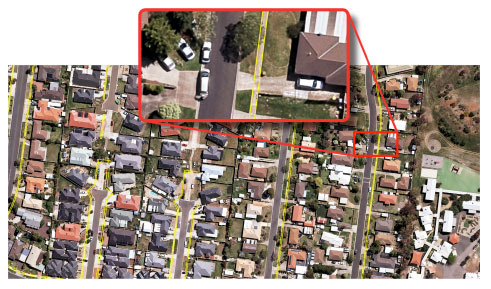 Dr Greg Foliente and his colleagues at CSIRO’s Liveable, Sustainable and Resilient Cities program have developed ‘Urban Sketcher’—a suite of algorithms that can recognise the patterns in aerial photographs of suburbs that indicate urban features, such as roads, buildings, footpaths, gardens and lawns, and take accurate measurements of their dimensions. “Using CSIRO’s supercomputing facility, Urban Sketcher crunches through high resolution aerial imagery of Melbourne and automatically turns it into Geographic Information System (GIS) datasets, the interactive ‘map layers’ used by urban planners and researchers in their work,” Greg says. Urban Sketcher’s first output—the footpath layer—was developed for AURIN’s Melbourne Urban Capture project to help urban planners and researchers model and improve the walkability of urban areas—an important feature of healthy, active cities. This mapped data of urban surfaces is also useful for understanding stormwater flows. But information about the dimensions of footpaths and driveways turns out to have another vital use: it can show emergency services how and where they can gain access to homes, buildings, parks and other areas in emergency situations. “The map layers are detailed enough to show the width of a footpath,” Greg says. The current industry practice is to take light radar or ‘LiDAR’ scans of urban areas from aircrafts flying at low altitude. While accurate, it’s an expensive approach—about $3.5 million per citywide scan. “What’s new about our unique approach is that we’re able to read and interpret high altitude aerial photographs, which are around eight times cheaper to produce than LiDAR,” Greg says. High altitude aerial surveying is already the preferred approach for many local and state government agencies, so Urban Sketcher could ultimately help governments and researchers make far greater and richer use of an existing resource. “LiDAR runs are only done once every few years,” Greg says. Map layers detailing building footprints are next for the Melbourne Urban Capture project. CSIRO researcher Felix Lipkin says this will have important applications in understanding and projecting the energy and water resource use of households, and in urban resilience and disaster management and planning. “Building footprints are important when you’re measuring exposure to natural hazards,” Felix says. The original aerial imagery for metropolitan Melbourne was produced for the Victorian Department of Transport, Planning and Local Infrastructure. The CSIRO team has processed these maps into GIS layers of footpaths and building footprints and made these available through the AURIN Portal, where other urban datasets have also been made available and integrated for research use. Read the technical background of the Melbourne Urban Capture project. 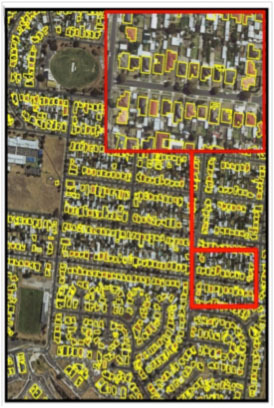 Read a related CSIRO blog story: Mining data from aerial photography of cities. For more information about the Melbourne Urban Capture project contact Dr Serryn Eagleson or Dr Greg Foliente. This entry was posted in Built Environment and Infrastructure, Energy and Water, Government, Housing, Latest News, Resources for Research, Sustainability, Urban Development, Walkability. Bookmark the permalink.